On Sale Now! Save 6% on the RDS Auxiliary Fuel Tank/Toolbox Combo - 60 Gallon, Model# 72644 by Rds at UCBC Group. MPN: 4383023. Hurry! Limited time offer. Offer valid only while supplies last. 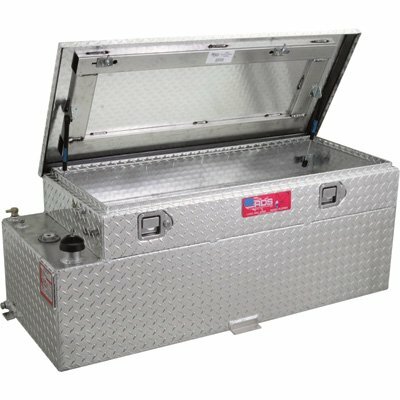 This RDS fuel tank combo provides an auxiliary tank with a toolbox built in! Auxiliary tank has fittings so it can connect to your factory lines. This RDS fuel tank combo provides an auxiliary tank with a toolbox built in! Auxiliary tank has fittings so it can connect to your factory lines. Diesel install kits (Item#s 3490901, 3490902 and 43748), are also available (sold separately). U.S.A. If you have any questions about this product by Rds, contact us by completing and submitting the form below. If you are looking for a specif part number, please include it with your message. Ellwood Safety 800 Aluminum Alloy Metatarsal Guard, 6" x5.5" x3.5", Silver, 6" x5.5" x3.5"